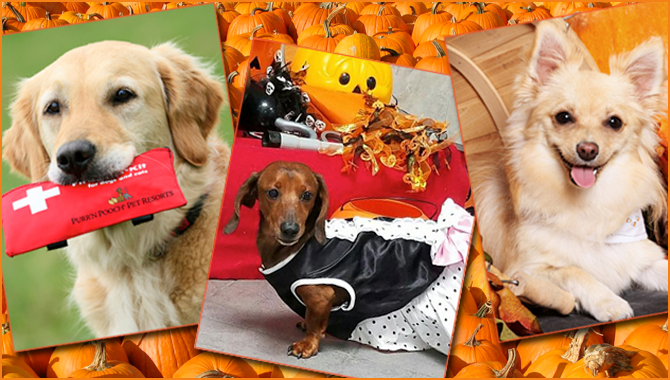 Purr'n Pooch Pet Resorts | Season of Pumpkins & Spice and Cooler Weather is Finally Here! Season of Pumpkins & Spice and Cooler Weather is Finally Here! October is the time of year for longer walks with your pet, changing colors, and the smells of pumpkin and spice. Purr ‘n Pooch Pet Resorts has a lot planned for the month of October. We will be hosting a Pet First Aid & CPR class in honor of National Animal Safety and Protection Month. Our spa special this month is Pumpkin Spice so your pet fits right into the festivities or maybe a little creative grooming is in store for your pet as all the fall and winter holidays begin. The Purr’n Pooch Foundation for Animals will be having a Paint & Sip to raise money for animals in need and we couldn’t forget our monthly birthday parties to celebrate our daycare friends born in the month of October. Join us for games on the playground and in our fresh water pools as we celebrate our daycare friends born in October. Photos will be posted to Facebook the following day. Wednesday, October 18 ~ 6:30 p.m. – 8:30 p.m.
Sunday, October 29 ~ 10:00 a.m. -12:00 p.m.
Bring your pet’s Halloween Costume with them on October 31. We will dress them up for the party and have a howling good time. The pet with the most creative costume will win a free day of daycare.